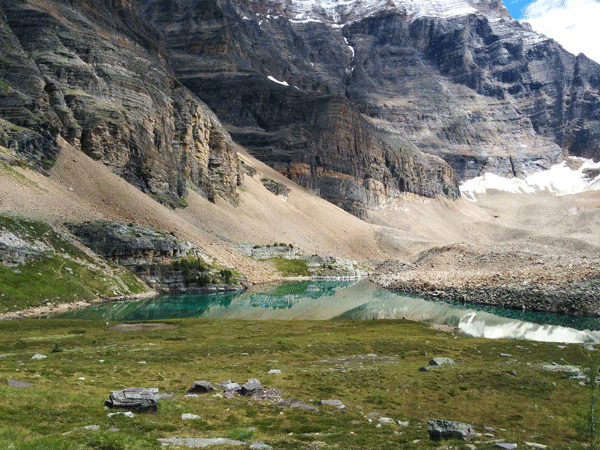 The Changing Cold Regions Network (CCRN) aims to understand, diagnose, and predict interactions amongst the cryospheric, ecological, hydrological, and climatic components of the changing Earth system at multiple scales with a geographic focus on Western Canada's rapidly changing cold interior. 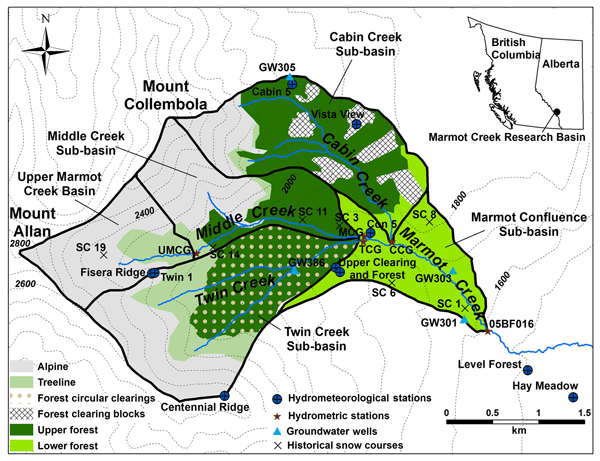 Across this region CCRN members operate a set of long-term water, ecosystem, cryosphere, and climate (WECC) observatories with data sets often spanning several decades. With this ESSD special issue, the Canadian network promotes the establishment, long-term maintenance, validation, description, accessibility, and distribution of high-quality cold-region data sets through a coordinated publication effort. The special issue is open to all submissions within its scope and welcomes related observational and model data sets from cold-region observatories around the world. We recorded hourly temperature and relative humidity in a dense meteorological network in the foothills of the Canadian Rocky Mountains over the period 2005–2010. 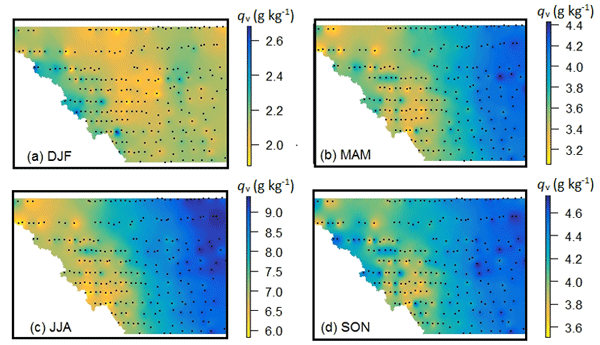 The observations reveal spatial patterns of specific and relative humidity, their relation with the terrain, seasonal cycles in the humidity patterns, and humidity characteristics of different weather systems. The results provide guidance to ecological and hydrological models that require downscaled weather data in mountain terrain. 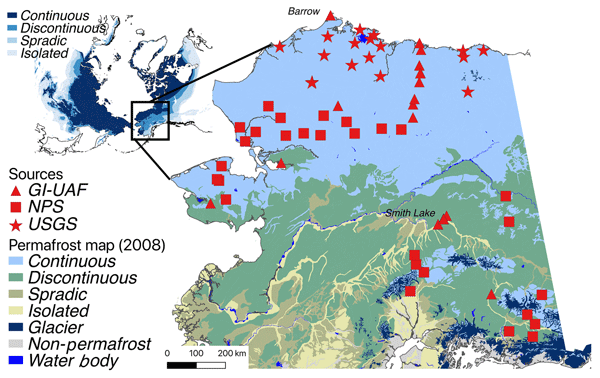 Ground thermal and moisture data are important indicators of the rapid permafrost changes in the Arctic. To better understand the changes, we need a comprehensive dataset across various sites. We synthesize permafrost-related data in the state of Alaska. It should be a valuable permafrost dataset that is worth maintaining in the future. On a wider level, it also provides a prototype of basic data collection and management for permafrost regions in general. This dataset documents physiographic and hydrometeorological conditions from 2003 to 2016 in the 155 km2 Baker Creek Research Watershed in Canada's Northwest Territories. Half-hourly hydrometeorological data were collected over several land cover types. The dataset includes streamflow, ground temperature, soil moisture, and spring maximum snow depth and water content. These data are unique in this remote region and provide scientific and engineering communities data to advance understanding. During and following the WMO Solid Precipitation Inter-Comparison Experiment (SPICE), winter (2013–2017) precipitation intercomparison data sets were collected at two test sites in Saskatchewan: Caribou Creek in the southern Boreal Forest and Bratt's Lake on the prairies. Precipitation was measured by the WMO automated reference and can be compared to measurements made by gauge configurations commonly used in Canada to examine issues with systematic bias. A high-density network of temperature and precipitation gauges was set up in the foothills of the Canadian Rocky Mountains, southwestern Alberta, from 2005 to 2010. 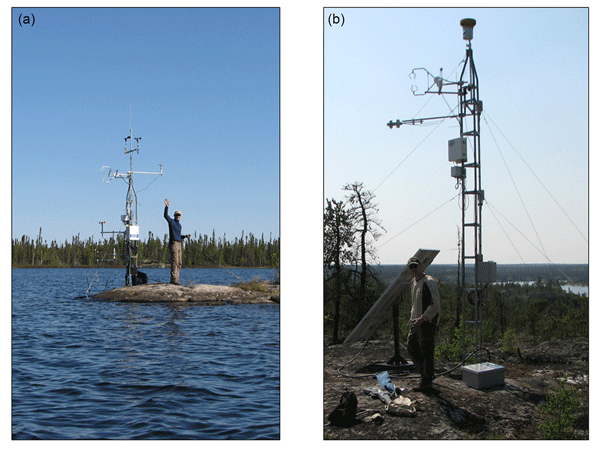 This array of backcountry weather stations covered a range of surface types from prairie farmland to rocky alpine environments, spanning an elevation range from 890 to 2880 m. This paper presents the daily minimum, mean, and maximum temperature data from the study and the associated spatial and vertical temperature structure.